The Dragon Age universe will expand in 2010 with an ongoing comic book series. BioWare created quite the deep setting for its recent epic RPG Dragon Age: Origins, so it makes perfect sense that it's being used for multiple forms of media other than videogames. There are already two novels available, a Flash browser game, and a pen-and-paper RPG on the way. 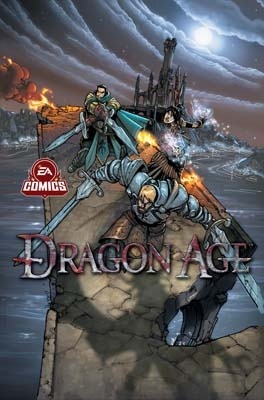 It should be no surprise that IDW Publishing will also be kicking off a Dragon Age comic book series in March 2010. Seasoned author Orson Scott Card has stepped up to write the series along with co-writer Aaron Johnston, with Mark Robinson handling art and Humberto Ramos on cover duty. IDW didn't reveal the storyline, but the description of the book gives some hints. The series will likely follow a "a new generation of Mages" that will "defy the rules of the Templars and change the course of the world forever." In Dragon Age's world, magic is tightly controlled by knights called the Templars due to a group of Mages that eventually corrupted themselves into the first Darkspawn, later unleashing a whole bunch of horrible creatures upon the lands and becoming the greatest evil the world has ever known. This "new generation" certainly has the potential to cause just as much anguish. Whoever they are, they sound like troublemakers. IDW also revealed that a bunch of new A-Team books will be coming out around the same time. This has nothing to do with Dragon Age, but the A-Team is awesome.